In middle school, rumor has it, Anthony Famiglietti’s friend put his spikes on his desk which made him say, “Whoa man, what are those? They look like punk rock! If I get to wear shoes like that, I’ll run track, man.” Truth be told, that isn’t exactly how he started running. In high school he wanted to quit the team. 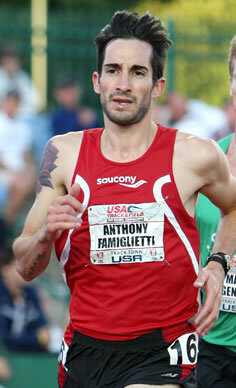 He ran a 3-mile time trial in 19:54. A senior on the team ran 16:00. “I’ll never be able to run 16:00. I’ll never be that good.” His coach told him, “You can get there, and even if you don’t, it’s worth the effort.” That made sense to him. How did a 4:24/9:24 high school 1600/3200 runner make two Olympic teams? Maybe it was his desire to prove people wrong. In high school he met exercise physiologist, and world renowned coach, Jack Daniels. He asked Daniels, “Do you think I’ll be a good runner? I am good at a lot of things and can spend my time on them if I’m wasting my time running.” Daniels responded, “I wouldn’t count on it. You probably won’t be that great.” Anthony thought to himself, “I’m going to prove this guy wrong.” Today Famiglietti consults regularly with Jack Daniels about his training. Go figure. So the question remains: How did a 4:24/9:24 high school runner make two U.S. Olympic Teams? Those are very good times, but not ones you’d expect from a 2-time Olympian. At Aim High, you’ll hear about his journey from high school to the Olympic Games and beyond! Anthony currently trains and lives in Knoxville, TN with his wife, Karen.